1. Login to your Administration Console. Navigate to Regions, located under Settings > Shipping > Shipping Regions. 2. Next click New and enter your desired Region Name. Add a number to the Priority box to make the Region more specific. The higher number takes precedence if an order falls into multiple regions. 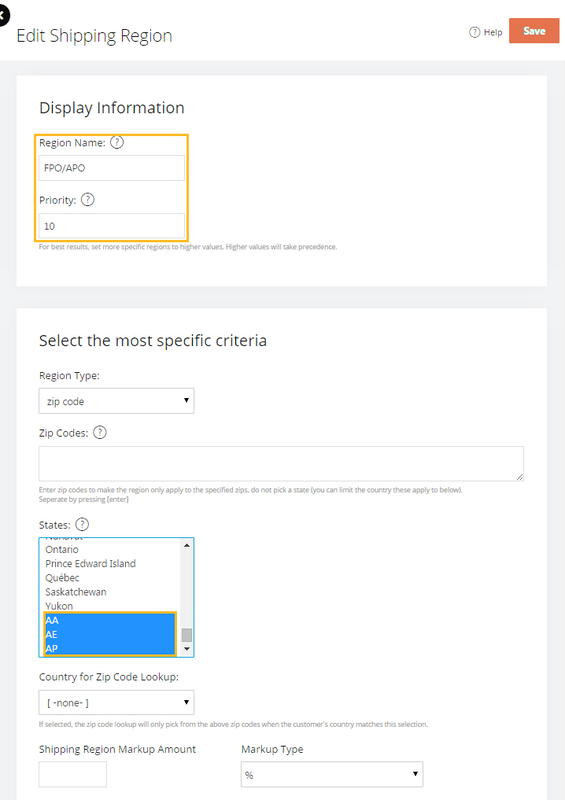 Select the Region Type, zip code, from the drop down menu. Zip Codes box is left blank. On the States drop down menu, scroll to the bottom of the list, hold down the Ctrl key and click all 3 states, AA, AE, and AP. Country for Zip Code Lookup is set to United States. Click SAVE. 2. From Custom Shipping Method's page, click on New to get to the screen shown below. This rule is what sets the limitations for the method. In our case it will limit the method to orders over $50. You can assign multiple rules to a single method if you would like. To add a rule, fill out the appropriate values to each of the fields, then click Add Rule. In our case we are using a starting value of $50 and an upper value of $9999999 to include all orders over $50. 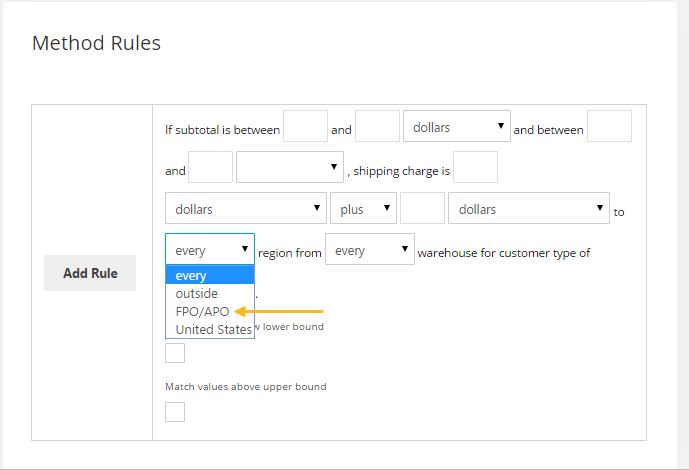 It is possible to limit the method to orders coming from a specific region, warehouse or customer type. 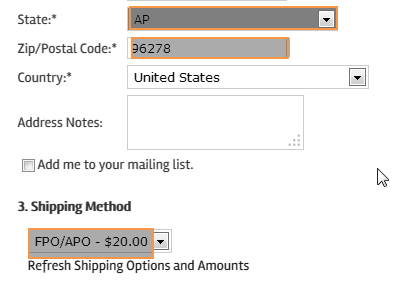 Do this by using a specific value in the corresponding fields to include all orders. NOTE: The "Add Rule" button must be clicked to save the rule BEFORE saving the method. To test the Custom Shipping Method, add a product to the cart then checkout. Set the State to AP and the Zip Code to 96278 and you will retrieve the shipping.